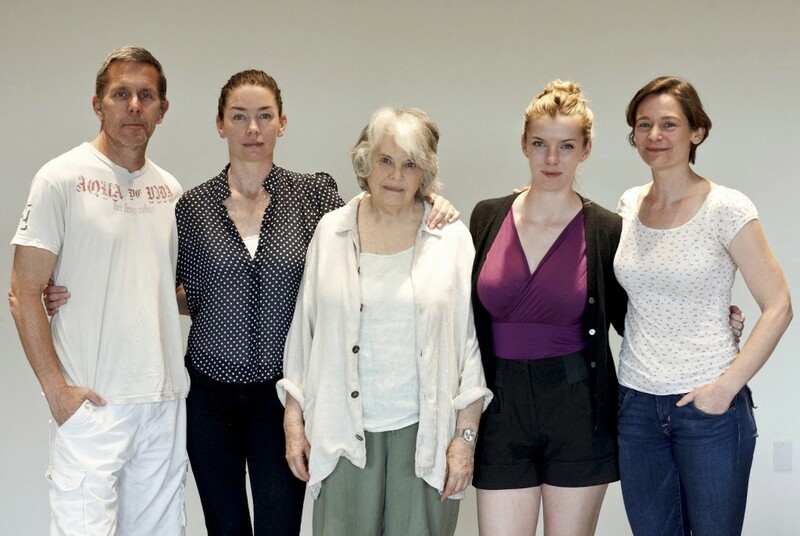 Gary Cole, Julianne Nicholson, Lois Smith, Betty Gilpin & Jenny Bacon. Photo by Gregory Constanzo. You’ve heard of An Actor’s Nightmare? Well, Jenny Bacon is living an actor’s dream. An accomplished veteran of stage and screen with a resume that includes some of the great theaters, writers and directors working today, she is now originating a role in a new play by Pulitzer Prize winner Sam Shepard. 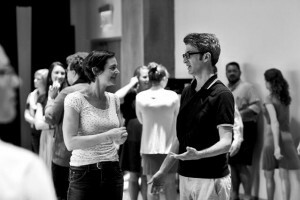 Heartless begins previews this week at the Signature Theatre in New York and Jenny graciously took some time from rehearsals to talk with me about working with a icons (including fellow cast member Lois Smith), balancing New York and Chicago theater and being the murdering type on Law & Order. I was two years younger than you at Northwestern. There’s no reason for you to remember me. You were definitely one of the people I looked up to. That’s good acting, already in college. It’s such a pleasure to get to talk to you again all these…cough…many years later. Seriously, a pleasure to talk to you, too. I have to start by asking you, what is it like to be originating a role in a Sam Shepard play? Is it a “pinch me” moment? Jenny Bacon & Daniel Aukin. Photo by Gregory Costanzo. Have you always been a fan of his work? 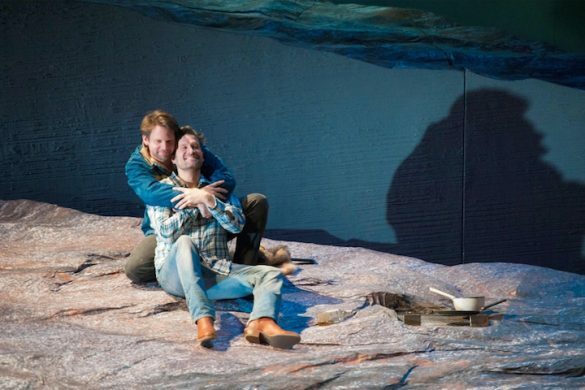 Everybody has their “the first time I read Sam Shepard or I saw Sam Shepard”, how it breaks [our expectations for] theater and the art of performing and what it is. It’s a social comment. It’s a political comment. It’s a literary comment. And he’s so very much a poet of our time. He speaks so strongly to so many of us. I don’t think I ever got to do it in acting class! I was reading it. And I was seeing the Steppenwolf production of Fool for Love. It was like, “That’s what I want to see. That’s what I want to do. That’s what I want to read.” It pushes your understanding of yourself and your craft to the absolute edge. That brings up an interesting question. You’ve been able to move back and forth between Chicago and New York; do you think there is something different about the two theater worlds? They both have been evolving the past — decades. But there’s a wonderful conversation that goes on between the two places. They both have incredible strengths and incredible weaknesses. They cover each other in a way. What do you think the greatest strength is of each? The greatest strength of New York is that every single person in the city, whether in finance or whatever it is — being a doctor, a writer — people come from all over the world to New York City to experience the top of the game. To push yourself. Which means it’s a city of incredible ambition. Chicago is more about…well, the disadvantage to working in a place [like New York] that is so much about ambition, is that it is difficult to make long, lasting connections that are consistent. We struggle in New York to make that happen. And it happens, I’m not saying it doesn’t happen in New York, but in Chicago, that’s the base. The base is “let’s find something really deep between artists and arts.” It’s about finding something special in between people. I sometimes envy the relationships I hear about in Chicago, a company will work with writers over a long period, over multiple plays. And actors work together over an extended time so that you build trust and relationships. Exactly. And that’s not to say that doesn’t happen here, but there’s so much going on. There are so many million things to do every second of the day in New York, you feel like you’re wasting your time no matter what you’re doing. 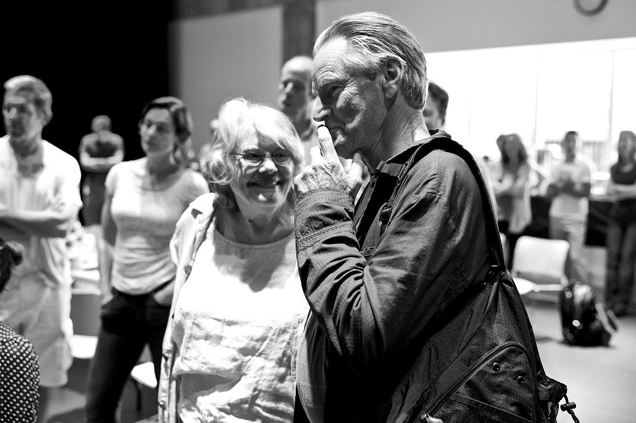 Lois Smith & Sam Shepard. Photo by Gregory Costanzo. You’re still in rehearsal for Heartless as we talk; can you give me a taste of what it’s about? Well…it’s definitely a meditation, as all of his plays are. It’s a meditation on some very primal fears and primal desires. They seem to — I don’t want to speak for the play before it…it’s definitely gestational, so I don’t want to impose anything on it. But at this point it seems to be a meditation on death and abandonment…and their opposites. It must be intense to go in there every day. You are going to love it. Lois is amazing in this role. She has an amazing understanding of Sam’s work. She really goes there and has a very special sensibility — her instrument and her mind are vast and wonderful. So now that you’ve ticked off that life goal list “originating a Sam Shepard role,” is there another playwright that you’re dying to work with? 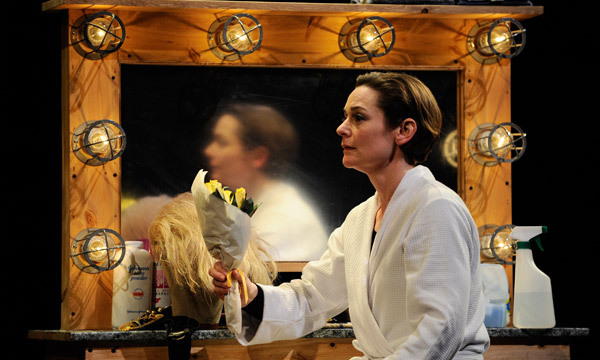 It’s not just women playwrights who are writing right now. I have two kids. They are five and seven. Oh my gosh. I guess they’d be too young to see you on stage yet? No, they actually saw me do, the first act anyway, of Sarah Ruhl’s play Stage Kiss, which I got to do the world premiere of last year. Jenny Bacon in "Stage Kiss". Photo by Liz Lauren. What was that like for them? Did they have a sense of “this is Mommy playacting”? They loved it. Because of course in that play…it was a very funny play with lots of fabulous costumes. So they would reenact it and dress up as the characters. They loved especially the silly moments. The company was wonderful and they loved it. This play [Heartless] I don’t think it’s really — I’ve told them it’s a grown up play because it’s mostly just people talking. I don’t think it would appeal to them as much. There’s not a lot of physical comedy that they could access. And probably not the fabulous wardrobe. Not for me anyway. No fabulous boas for me. Sorry to take this down to a different sort of level here but I have to ask. You do have the New York City actor triple crown, you have been on all three Law & Order series. I think it’s actually a mark of honor in New York. Were you ever the murderer? I’m always the murderer. Or you always think that I’m the murderer. (laughter) Really!? Why do you think you were always cast that way? I have friends that were on and they were never the murderer or the suspect; they were always a witness. So there are hidden depths beneath there. There’s a gentleness, I guess, that comes across as super creepy. Looking back, knowing what you know now, if you had a chance to talk to that college student that you were, that I knew back at Northwestern, is there something you would tell her? Something to prepare for or some advice? Be brave. Oh and also, it’s a tricky thing, but people come into themselves at different times. What you are as an actor changes. That’s one of the reasons we get into it because there’s sort of a voice for you no matter where you are. Or you can provide a voice. And it’s tricky because you are always in the act of “becoming”. But somehow being comfortable with what you are right now and offering that, rather than always — for a young actor it’s always important to be looking forward and thinking about what is it that I want to become — but it’s the rare young actress, like Betty Gilpin who is in this show, who has a real awareness for who she is, as well as what it is that she hopes for. What it is that she is right now! That’s an amazing gift. Do you have a sense of when you got that for yourself? Did you already have that in college? No, I’m still working on it right now.